Description: Conferring the 3rd Degree of Masonry upon Bro. Bridges who will be raised to the sublime degree of Master Mason. Description: The Honored Ladies Luncheon will be held at East San Diego Lodge, located at 7849 Tommy Dr. Cost for luncheon will be between $12 - $13. Please make your reservations with our Secretary at 619-295-4420 or with Marty Haslim at 858-695-8407. Description: SW Hackett will be having a Table Lodge for masonic education. 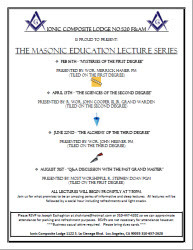 All masons are welcome to attend. Please make your reservations with the Secretary if you plan on attending at (619) 295-4420. The cost is $25, seating is limited, so please make your reservations ASAP. Description: Conferring the 3rd Degree of Masonry upon Bro. Capps who will be raised to the sublime degree of Master Mason.